BPDU Packets are encapsulated in Ethernet Frames! Basically you showed it on your graphic already, so you might already know about. Does a BPDU frame have a preamble? Does a BPDU frame have a CRC? Is a BPDU frame followed by an interframe gap? Is the frame control field the same as the start delimiter? On 802.4, 802.5, and FDDI LANs, there are a few octets preceding the Destination MAC Address, one of which is protected by the FCS. The MAC Type of the frame determines the contents of the Frame Control field. A pad octet is present to provide 32-bit packet alignment. So the Frame Control field is only used when you are having Token-Ring(802.5), Token-Bus(802.4) or FDDI as Medium Access. • Frame type bit—Used to indicate whether this is a MAC or LLC frame. • Reserved bit—Reserved for future use. hope it helped you and thanks for the question, didnt know the part about frame control yet. BPDU Packets are encapsulated in Ethernet Frames! "BPDU FRAMES are Ethernet Frames"
"BPDU FRAMES are encapsulated in Ethernet Frames"
Finally if everything isn't just simply tossed into the payload field which order does everything fall into? Does the Frame control replace the start of feild delimiter or does it just sit next to it. Does the LLC feild replace the type feild or does it just sit in the payload or is it placed directly after it. first id like to differ between Frames and Packets..
Packets are encapsulated in the payload of the Frame. So Frames contain Packets. So BDPU Packets are encapsulated in Ethernet Frames. Or "can be encapsulated in Ethernet Frames" since if ur using Token-Ring for example its a bit different. Graphic 1 and 2 both show the same thing basically. Thats most likely what irritated you a bit. In number 1 the Ethernet Frame is shown more detailed from preamble to Interframe gap. Even the optionally Vlan tag field is shown. In number 2 its again an Ethernet Frame. But this graphic was not made to show all detailed information. It simply shows you the order of the fields, but specifically for BDPU. The Preamble and FCS and all the stuff that is missing just follows the same order like the standard ethernet frame. The graphic just tells you in which order the frame control field and the llc field follows up in the frame. 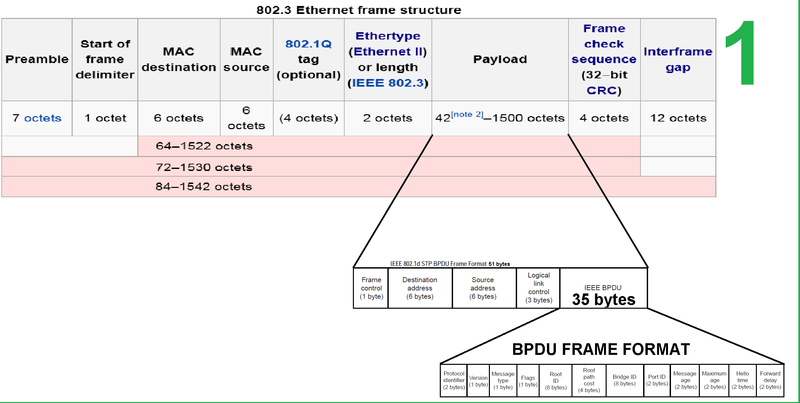 By the way, thats why the picures name is "IEEE 802.1d STP BPDU Frame Format" Its already a complete frame with an encapsulated BDPU packet. Number 3 shows a BDPU packet (not a frame) as it is encapsulated in the payload of the ethernet frame.